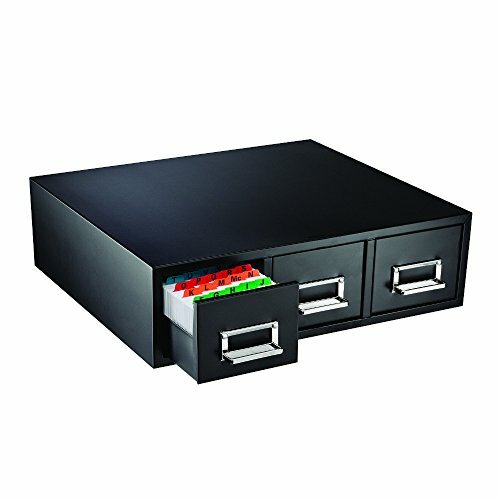 The STEELMASTER Steel Card File Drawers are designed to fit 3 x 5 inch index cards. These side-by-side drawers hold up to 1,500 index cards each. A label holder on the front of each drawer can be used for content identification. With sturdy pull handles for easy opening and closing, these drawers are coated in black with a scratch and chip-resistant powder finish. Rubberized, non-mar feet prevent slipping even if the drawers are stacked. A follower block and compressor lock keep cards upright-no matter the number of card. Made in the USA with a minimum of 20% recycled content.